30th October, 2018 – DJI, the world’s leader in civilian drones and aerial imaging technology, today opened the doors to its third annual AirWorks enterprise drone conference by showcasing new hardware, software and strategic partnerships, expanding the global DJI ecosystem to help more enterprises embrace the benefits of aerial productivity. DJI showcased the Mavic 2 Enterprise, its latest and most portable commercial drone which features zoom imaging, modular accessories and heightened security features for professionals ready to put drones to work. DJI unveiled a realistic new DJI Flight Simulator which helps equip new drone pilots with skills for a new era of work. DJI also launched the official version of DJI Pilot, its flight control app designed for professional use, and introduced upgrades to its Ground Station Pro (GS Pro) software which helps enterprises manage drone fleets. Industry leaders demonstrated their use of DJI platforms for deep aerial functionality in their work, such as inspecting railroad bridges with Union Pacific and AutoModality, jetliners with American Airlines, and power lines with Southern Company; and Microsoft’s Windows Software Development Kit (SDK), which enables a wide world of custom drone applications and payloads to be controlled by computers running Windows 10. The 12-megapixel camera has 2x optical and 3x digital zoom capability, allowing precise monitoring of dangerous, distant or difficult scenarios. AirSense technology automatically alerts drone pilots of ADS-B signals from nearby airplanes and helicopters, providing an extra level of safety in congested airspace or complicated operations. Data security for sensitive flight missions is built in, with password protection for onboard data storage, GPS timestamps for every recorded image, and Local Data Mode integration to stop all internet data transfer. Mavic 2 Enterprise also features custom accessories to expand its capabilities in professional situations, including a powerful spotlight to illuminate nighttime operations; a loudspeaker to broadcast critical instructions and messages to anyone within earshot; and a bright beacon to make the drone visible to other operators and aircraft from miles away. DJI demonstrated the Mavic 2 Enterprise for AirWorks 2018 attendees, and American Airlines, the world’s largest airline, debuted a video showing how the drone can be used to perform an aircraft inspection in a hangar more safely, efficiently and quickly than with traditional means. To learn more about Mavic 2 Enterprise, please visit www.dji.com/mavic-2-enterprise. To watch a video inspired by the demonstration, please click here. DJI is also expanding the functionality of its platform by making it easier for enterprises to collect, manage, share and protect drone data. New software packages recognize that the systems for operating drones and managing their data are just as important as drones themselves in providing value to the enterprise. As enterprises rapidly adopt drone technology, they must develop standards to train and manage the new corps of drone pilots required to operate their fleets. DJI Flight Simulator is designed to create a realistic simulated flight experience for pilots in training, allowing them to hone their skills without the costs, restrictions and potential risks of real-life training. The DJI Flight Simulator runs on a computer and is controlled by a DJI drone remote controller. Pilots take off and fly in a life-like environment, which can be manipulated to provide different wind and weather conditions, lighting and visibility. They receive feedback from the surroundings just as they would piloting a real drone, learning how to manage complicated flight situations and safely perform their missions. DJI Flight Simulator allow pilots to practice flying in varied environments, such as an island or a city landscape, as well as to train for a specific application, such as power line inspections or search and rescue missions. Enterprises can also customize training courses to meet their specific requirements. Flight Simulator supports most DJI drones, including the Mavic 2 Enterprise, the Phantom 4 Pro, the Inspire 2 and the Matrice 210 RTK. DJI’s premier flight control app for professional work, DJI Pilot, is now out of beta and available on both Android and iOS devices. DJI Pilot is seamlessly compatible with DJI enterprise drones and payloads, giving pilots the capabilities they need to operate most efficiently and get the most value from their drone operations. DJI Pilot is purpose-built to provide the intuitive functionality that enterprises demand, allowing pilots to build detailed operations into their flight plans and generate true semi-automatic inspection capability. It can create and control the parameters of a flight as well as photo and video operations along the way. It can operate a range of professional payloads, including the Zenmuse XT2 thermal imaging camera and the Zenmuse Z30 zoom camera; accessories for the new Mavic 2 Enterprise; and third-party payloads built on the DJI Payload SDK. DJI Pilot also integrates with other DJI software systems for enterprise applications. It can share a live video feed and real-time flight data from a drone with the DJI FlightHub fleet management software; it supports Local Data Mode operations, which sever all internet connections to ensure customer data remains secure; and it displays warnings from the DJI AirSense system when a Mavic 2 Enterprise or Matrice 200 Series drone detects a signal from a nearby airplane or helicopter. The upgraded GS Pro app is a powerful flight route planning tool that gives critical missions added accuracy and reliability. With this version, enterprises will now be able to manage fleets of drones, the pilots who operate them, the missions they fly and the data they generate. GS Pro’s enhanced functionality enables cloud data storage and backup, as well as more robust data sharing options with accompanying controls for which only members of teams with the necessary permissions can view and operate relevant flight missions. Users can use their DJI Account credentials to store and track the data they generate using the app. The intuitive interface now also lets users plan and execute automated flight missions with just a few taps. Pilots and managers can create repeatable missions, enhancing reliability and accuracy in flight operations, as well as to review past flights to optimize future missions. As drones become standard tools to increase aerial productivity, DJI’s strategic partners have taken a proactive role in demonstrating how the DJI ecosystem gives them the tools and the platform to build custom drone operations. At AirWorks 2018, some of these leaders in aerial innovation showed how enterprises can adapt new technology to enhance their operations, and provided inspiration for other business, government, academic and nonprofit users to adopt that technology in their work. Southern Company formalized its ongoing collaboration with DJI by announcing that it is now a Solution Development Partner. A leading adopter of drone solutions, the company will help co-develop and test customized solutions for the utilities industry, and will continue to explore ways in which it could expand the use of drone solutions across a wide range of applications from airlifting heavy loads to the top of power poles to routine maintenance inspections. Microsoft is developing ways to integrate its Azure IoT, edge computing and AI cloud services and developer tools with DJI drones, to enable a broad range of high-value commercial IoT scenarios. Today, Microsoft and DJI are announcing the public preview of the DJI Windows SDK which developers can now access by visiting http://github.com/dji-sdk/Windows-SDK. With the SDK, drone solutions developers can wirelessly transfer images to Windows-powered edge devices, integrate and control drones and third-party payloads via Windows apps and bring real-time AI and machine learning capabilities to imagery from DJI drones – exponentially increasing the way drones can be used and scaled in the enterprise. Union Pacific, North America’s premier railroad franchise, worked with AutoModality, the automated flight control leader, to demonstrate how they built on top of DJI drone platforms to perform automated inspections of the Benicia–Martinez Bridge north of San Francisco, which is the second-longest railway bridge in North America. Propeller Aero launched the Propeller PPK solution which is a fully integrated software and hardware system that leverages DJI’s Phantom 4 RTK drone. Distributed through their channel partners, including Trimble’s SITECH network, the solution will increase surveying efficiencies by 70% across the civil, mining, aggregates, and waste management industries. Skycatch announced that the Skycatch Edge1 GNSS base station is now available worldwide. Manufactured by DJI, the Edge1 streamlines workflows with centimeter-level data outputs in 30 minutes or less, and gives all DJI users the ability to process and receive data without the need for internet or cellular connectivity. 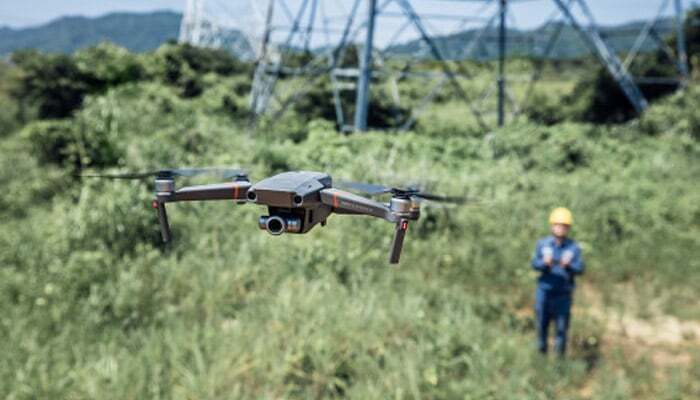 Kespry has integrated the DJI Mavic 2 Pro drone as part of its stockpile measurement solution for mining and aggregates companies. The solution delivers the unique Kespry autonomous flight and aerial intelligence experience for stockpile measurement using DJI drones. Be the first to comment on "DJI Expands Drone Ecosystem With New Hardware, Software and Partnerships To Help Enterprises Gain Aerial Productivity"